Your Weekly guide to keeping busy in the Old Pueblo. Duran Duran Tribute. Are you hungry (like the wolf) for some good entertainment as a prelude to the weekend? Don’t miss a performance by Planet Earth, a group of five musicians who love the ’80s and like to incorporate period instruments and precise costuming into their sets. They’ll be playing stuff all the way from the early ’80s to the mid-2000s, so the odds of your favorite Duran Duran song being in the mix are high. It’s hard to believe something this great could happen in an Ordinary World, but it can! 8 p.m. Thursday, May 31. Paradiso Lounge at Casino del Sol, 5655 W. Valencia Road. Free, 21+. This is Folklife: Unpacked. No matter how much you know about country music, you could almost certainly learn something from ethnomusicologist Kate Alexander, a UA professor who is currently researching queer country music and dance culture. She’ll give a talk that will include country music’s European and (enslaved) African origins, the masculine country cowboy archetype, and alternative forms of country like the ones she studies. 1 to 4 p.m. Saturday, June 2. 44 N. Stone Ave. $45. Creed Bratton at 191 Toole. There are few characters quite so charming as Creed in The Office. He once said “I am not offended by homosexuality. In the ’60s, I made love to many, many women, often outdoors in the mud and rain. It’s possible a man could’ve slipped in there. There’d be no way of knowing.” Through his signature wow-that’s-so-creepy-it’s-kind-of-funny delivery of lines, viewers learned Creed’s character in the show was a man who knew his cults, his painkillers, his mung beans and his DIY hair-dyeing techniques. 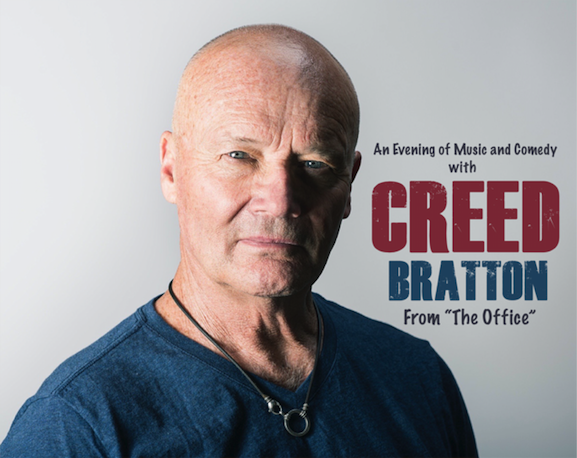 At this show, viewers have the chance to see Creed in a totally different role—a sweet, folksy singer-songwriter. Doors 7 p.m., show 8 p.m. Thursday, May 31. 191 Toole, 191 E. Toole Ave. $20 to $25. Friday Night Live Summer Jazz Concert Series. Have you been going to the concert series at Geronimo Plaza? If you haven’t, why not? These Friday night shows are completely free! And this week’s band Purple Spectre has so much going on, it’s really like seeing several different bands at once. The modern jazz/fusion quintet features Angelo Versace of the UA School of Jazz on the Rhodes Organ, as well as musicians on the electric bass, saxophone, trumpet and drums. Get ready to feel really classy as you spend your evening in the park listening to jazz. 7:30 p.m. Friday, June 1. Geronimo Plaza, 800 University Blvd. Free. The Little Big Art Show. For such a small word, art is one of the biggest, broadest and universal things out there. While in that sense, there really is no little art, art sometimes comes in the form of small-scale sculptures, covers compact canvases or uses miniature mediums. When you bring a bunch of those together for a display at the Contreras Gallery, you get a “Little Big Art Show.” Check out art by the likes of Jane Buckman, Nina Duckett and Ruben Moreno, and be free from the worry that you’ll spend your whole time at the gallery staring at one enormous piece on the wall that you don’t understand. Show runs Saturday, June 2 through Saturday, July 28, with opening reception from 6 to 9 p.m. on June 2. Contreras Gallery and Jewelry, 110 E. Sixth St. Free. Scenes from Salvaged Scraps: Debbie Gill’s Miniature Rooms. Is making miniatures something you’re interested in getting into, but you’re not interested in investing the money to buy wildly specific tools and prefabricated tiny furniture for? Debbie Gill felt the same way when she was 5, looking through a catalogue of miniatures that just didn’t look anything like the furniture she knew and loved from her 1960s household. She started using wood scraps to make her own pieces, and hasn’t looked back since. Today she only uses disposable materials for her miniatures, including plastic lids, magazines, Styrofoam and broken jewelry. The result? Super cool (and super tiny, obviously) depictions of households with décor from anytime between the 1960s and now. Tuesday, June 5 to Sunday, Aug. 26. 9 to 4 p.m. Tuesdays through Saturdays and noon to 4 p.m. Sundays. Closed holidays. $9 GA, $8 senior/military, $6 student, $6 youth, free for kids 3 and under. Summer Art Cruise. Is a leisurely cruise through the Caribbean just not in the financial cards for you this year? Treat yourself to a cruise around some of Tucson’s finest art galleries, hosted by the Central Tucson Gallery Association. The Conrad Wilde Gallery is featuring an exhibit by artist Jessica Drenk, the Contreras Gallery has their Little Big Art Show featured in the cruise from 6 to 9 p.m., and the Davis Dominguez Gallery is displaying an exhibit called “Small Things Considered” from 6 to 8 p.m. for the art cruise. 6 to 8 p.m. on Saturday, June 2 at several galleries on Sixth St. See ctgatucson.org/index for more details. First Fridays Family Fundays at the Farmers Market. With June upon us, it can be all-too tempting to hole up inside your house and let your children stay there with you. But when Trail Dust Town and Heirloom Farmers Market Team up for a monthly event that’s this full of food and fun, it’s harder to use the heat as an excuse. With 20 local food vendors, music by Michael P. Nordberg, face painting, hula hooping and Spanish story time for the kids, there’s fun for everyone. For six bucks, pick up a wristband that gives kids unlimited access to the Ferris wheel, carousel and train, keeping them busy while you check out all the local produce, grass-fed meats, homemade salsa and gluten-free goods. 8 a.m. to noon. Friday, June 1. Trail Dust Town, 6541 E. Tanque Verde Road. Free entry. First Fridays at the Arizona History Museum. Another month, another free trip to the Arizona History Museum. This week’s theme: On the Trail of the Mariachi Miracle. Dan Buckley, writer, composer, videographer, photographer and documentary-maker, will be sharing the progress on his most recent project, a documentary about the mariachi movement. Buckley has also made documentaries about Tucson’s Spanish language theater and El Casino Ballroom. 6 p.m. Friday, June 1. Arizona History Museum, 949 E. Second St. Two-for-one discounted admission starts at 4 p.m. Normal admission prices are 4 bucks for kids 7 to 17, $5 for adult students, $8 for those 65 and up, $10 for adults, and free for kids under six, as well as veterans and museum members. Summer Safari Nights. We all know it’s a dog-eat-dog world out there. The Reid Park Zoo is going to serve up some serious truths at this week’s iteration of their summer program, which is themed “Predator Power.” It might be hard to swallow that animals need to kill and eat one another to survive and keep habitats healthy and balanced. But it’s not hard for these predators to swallow their delicious prey (have you SEEN a snake eat?) Cadillac Mountain provides the evening’s entertainment, and there’s plenty of food and drink specials, as usual. 6 to 8 p.m. Friday, June 1. Reid Park Zoo, 3400 Zoo Court. $10.50 adults, $8.50 seniors, $6.50 kids 2 to 14, half off for zoo members. Make it Mondays at the Children’s Museum. Mondays are no good, and Mondays during a Tucson summer are even more abysmal. But the local children’s museum has got the perfect remedy for your Monday Blues: They’re open until 7 p.m., admission is only 3 bucks and they feature really neat special guests all through the summer. This week, they’re hosting Beucher Biological Consulting for BAT DAY, with real, live bats! Not only is this Monday going to be not boring and terrible, but it’s actually going to be pretty great because our big-eared, winged friends will be joining us. Bats will be there from 3 to 6 p.m., but museum hours are 9 a.m. to 7 p.m. Tucson Children’s Museum, 200 S. Sixth Ave. $3. Free First Saturday Fairy Lights. Head over to the place in town that, were it a “Best of Tucson” category, would consistently win for “Place You’re Most Likely To See A Fairy, If Fairies Do Turn Out To Exist.” During the event, guests are encouraged to move through the space quietly and slowly so as not to scare the magical creatures and to increase chances of a sighting. Godspeed, sprite seekers! 7:30 to 9 p.m. Saturday, June 2. Valley of the Moon Tucson, 2544 E. Allen Road. Free. Cool Summer Nights. Put on a podcast or an album with those great “late afternoon” vibes and make the drive out to the Desert Museum for this week’s event at the Desert Museum, the theme of which is “Creatures of the Night.” There’s art exhibits, free family art activities, a chance to touch the stingrays, and docents all over the place laying down wisdom about desert skies, kissing bugs and fluorescent minerals. There’s also a presentation about how to get the best photos of animals at the zoo, and two shorter presentations from zoo keepers all about what their jobs are like. We know this event is called what it is because of the temperature of desert evenings, but it’s also just such a dang cool way to spend a Saturday night. 5 to 10 p.m. Saturday, June 2. Arizona-Sonora Desert Museum, 2021 N. Kinney Road. $22 GA, $20 seniors 65 and up, $9 kids 2 to 12, $18 military, $17 Arizona/Sonora resident. Graham Blues Fest. Feelin’ a little bluesy? Or just feeling like you’ve got the blues and want to go on a road trip to hear some good music? 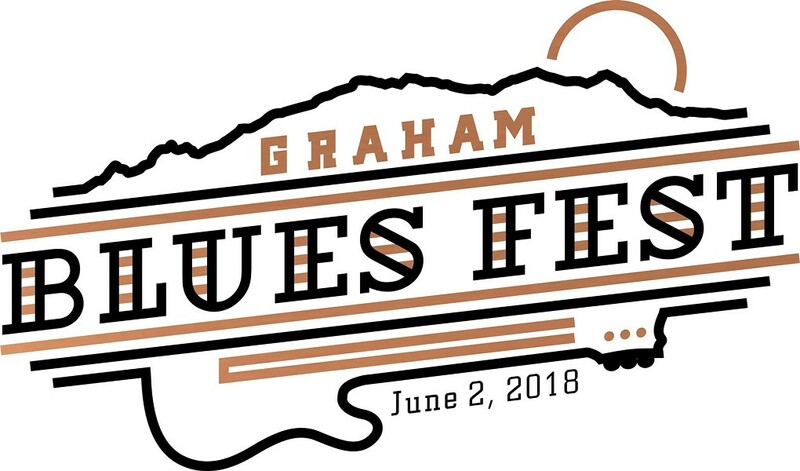 Head over to the Graham County Fairgrounds for the county’s inaugural blues festival. There’ll be blues musicians from all over Arizona, including Heat Stroke, Blues Berry Jam Too, Cat Daddy & The Twelve Barz Blues Band, Bad News Blues Band and Chuck Hall. VIP tickets are available if you have some extra cash and want a bunch of drink tickets, meals, commemorative T-shirts, posters and a special air-cooled tent for the day. 10 a.m. to 10 p.m. Saturday, June 2. Graham County Fairgrounds, 527 E. Armory Road. $20. Smithsonian Water/Ways Exhibit – Bisbee. You gotta admit there’s some pretty essential parts to keeping the town of Bisbee running. Art supplies, of course. And a steady stream of bohemian artists to use the art supplies. 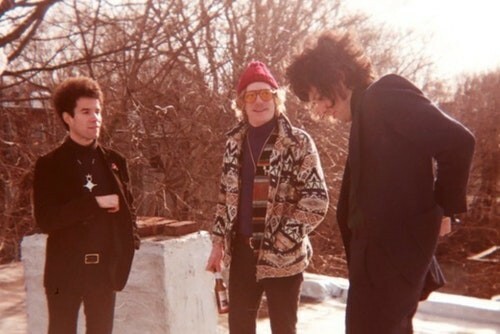 And, though it may never before have seemed worth mentioning, the town needs water to keep all those badass bohemians alive. This exhibit is traveling to 12 rural communities in Arizona, and during its stop in Bisbee, it will include local exhibits and information on the cultural and environmental impact of water in Bisbee in the days of yore–and today! 10 a.m. to 4 p.m. Sunday, June 3. Bisbee Mining and Historical Museum, 5 Copper Queen Plaza, Bisbee. Adopt-A-Bee. The bees of Tucson are busy as bees this summer, identifying plants, cutting leaves, woodworking and maintaining the cacti. You can support their mission by participating in this Tohono Chul program to adopt one of them. 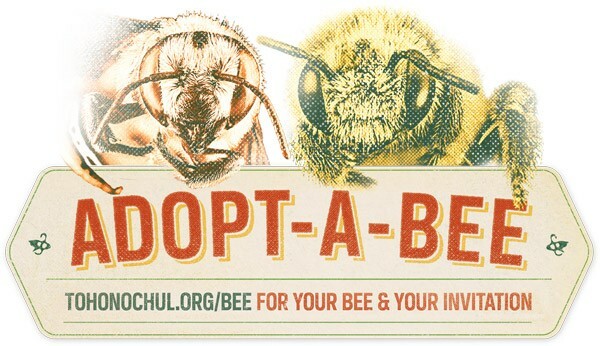 By making a donation of $5 (Cactus Bee), $20 (Blue Mason Orchard Bee), $55 (Leaf Cutter Bee) or $100 (Carpenter Bee), you’ll get a photo and naming rights for one bee (Here Comes Honey Bee-Bee, anyone?) as well as an invitation to a “Pollinator Party” at 6 p.m. on Friday, June 22, in honor of National Pollinator Week. Different levels of tickets come with different goodies, like drink tickets for the party, an art project by a bee(?!) and even a bee nursery. A disclaimer on the event page reads, “as these bees are wild and do not perform on command, we make no guarantees that you can ‘meet your bee’ or shake its tarsal claw.” But if you ask us, it still seems worth it. Make haste! You want to lock down that invite to the biggest Pollinator Party of the year. Surviving Summer on the Arizona Trail at REI. If you have some time off this summer, it might be tempting to hit the trails you didn’t have time to hit all winter. And you can! But first, you should stop by this course about all the gear and techniques you need to stay safe in the heat. Members of the Arizona Trail Association will even be providing info about which destinations are the best for keeping cool. Opt outside—but not before filling and refilling your water bottle. 6:30 to 8 p.m. Thursday, May 31. Tucson REI, 160 W. Wetmore Road. Free. Superhero Bar Crawl. Marvel? D.C.? Don’t really care, but into superheroes in general? Tie on your cape, slap on your mask and put your underwear on over your pants because Superhero Bar Crawl and Marvel vs DC Bar Crawl are partnering up to take over downtown to kick off the month of June. The crawl down Fourth Avenue and Congress goes from 5 to 9 p.m., and the after party at Highwire Lounge goes on for another hour. Even superheroes need a night off. And maybe, if you’re lucky, someone will thank you for your service to humanity and offer to buy you a drink. 5 to 10 p.m. Friday, June 1. 536 N. Fourth Ave. $20+. Calling All Robots: Save the Humans! Don’t let the name fool you—humans are welcome to attend this event as well. 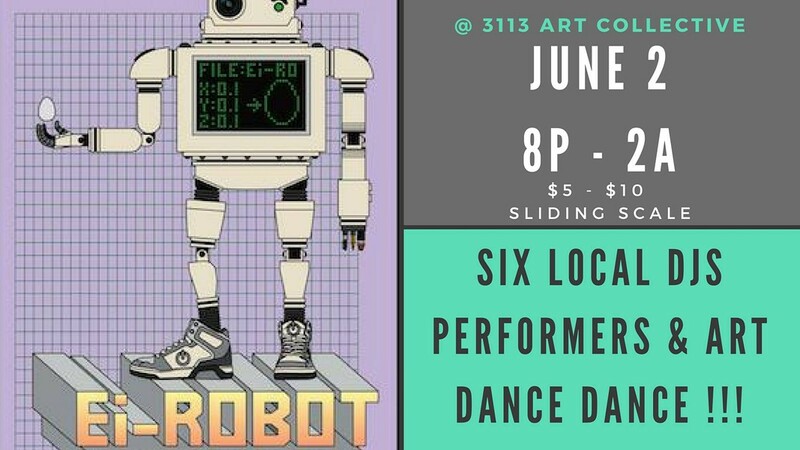 3113 Art Collective is hosting a night of dancing, local art and six local DJs spinning tunes. The party is a fundraiser for the crew of Ei-Robot, an art project for Burningman 2018. More specifically, it’s a robot that helps people make sculptures. But first, a crew of humans needs your help to buy safety gear for the whole shebang. Boogie on down—do the robot! 8 p.m. to 2 a.m. Saturday, June 2. 3113 Art Collective, 3113 E. Columbia. $5 to $10 sliding scale.